So if the previous strip with Mombot showcased how videogames can be used as a learning tool and force for good, then today’s strip reveals how they can have the exact opposite effect when used as a force for misinformation and lies. As many of you know, Charles Darwin was born 200 years ago last Thursday (February 12, 1809 – 2009) and I just wanted to commemorate that occasion with a strip. I also wanted to draw some Pokémon and explore the theme from the previous strip a bit more, so it all fell together nicely. Check out the Natural History Museum’s Darwin200 site for info about Darwin’s contributions to science and humanity, and events celebrating his birthday. is this the emperors new clothes episode? I can’t see the strip 🙁 I need my tuesday fix! best strip yet. easy and quick to read. not much to look at. great for the busy executive on the go. I also can’t see the strip. Tried refreshing, using different links, even tried to force it with ‘Show Picture.’ Nothing worked! I’m with G. Too much “ooh, loook COLORS!” in the usual strip. I’m enjoying this week’s minimal quality. Now is the time on Schprockets vhen ve DAHNCE! You seem to have uploaded the PSD graphic by mistake, not the exported JPG. No image for me either. Me too! Where is it??? Where is the GENIUS? Are you taunting us, have we offended you somehow? GUH. sorry folks! i wasn’t intentionally messing with you guys! i did indeed upload the psd instead of the jpeg by mistake last night (thanks, Jor!). so it looked okay on my mac (safari can see psds, apparently), but nothing else. all should be well now. if there are still probs, let me know. this is why doing the strip at 3 in the morning is sometimes a very bad idea. woohoo! I just appreciate knowing it wasn’t just me. Love the strip been reading for quite some time. That’s actually not a bad way to explain it, you just have to tell the kid that the weaker Pikachu gets rejected by the ladies and later gets killed by some young wannabe alpha Pikachu…. And, this is why no one believes Jefbot’s telling the truth. So funny! I love it! I LOVE the eyes in the last frame! Now who is the Darwin guy??? …and is he REALLY still alive after 200 years? if death is the way we humans evolve to the next stage of life, then the answer’s yes, funnyshaffer! Hee, hee! Blurring the truth with children is fun! Also old people. The desire to draw Pokémon is a natural human urge; as natural as breaking all the vases in your house hoping rubies will pop out from the shattered pieces. thanks, Foxmouse! glad to know we share the same urges. i assume you dig holes in the yard and slice through grass looking for hearts too, right? Aww this is an awesome strip! I loves it! you’re absolutely right, Shan!!! how could i possibly have forgotten about the thunder stone!? my only excuse is that i haven’t evolved my pikachus since the original pokémon blue, cuz i like pika more than raichu. anyhow, i might have to give you a prize for catching that. thanks, Shan! script has been changed for accuracy. pikachu’s definitely my #1 too, DaughterJudy. psyduck, gengar, bulbasaur, mamoswine and snorlax are among my other faves. just as some videogame developers have used norse mythology as inspiration, while others have used world war ii or vietnam, the theory of evolution seems to have influenced the developers of pokémon, which just goes to show how significant darwin’s “crazy” theory still is after all these years, Kylej64! i consider it my duty, reynard61. i’ll try and be more careful when uploading images in the future so people won’t have to use safari just to view the strip, Sonitan! 😉 hmm. i guess google chrome and firefox users couldn’t view the other file either, then? or was it just IE users? anyway, yeah, pichu’s pretty cute, but pikachu’s still my fav! hahaha! Pikachu! man, that’s a great way to explain Evolution! it makes so much sense now! Pikachu! pika pi! i submit that nintendo/game freak should send out free copies of pokémon games to biology classes around the country. or at least pokédex posters for the classrooms. dontcha think, alecho? Ya know, thats an even better explanation than that my teachers gave me. Great comic (as usual) Jefbot! I was so sad when I couldn’t see it yesterday…so this just made my morning! By the way, love your evil expression in the last frame; it just shows you ARE related to Xinda. HAHAHAHA! Not much of a pokemon fan here, but I love the way it explains darwin. Darwin was more talented then I thought! But certainly with a different twist to it. I think I understand Natural Selection easier than I understand the allure of Pokemon! Evolution I choose you! Awesome, bot! I love the little boy. He is adorable. 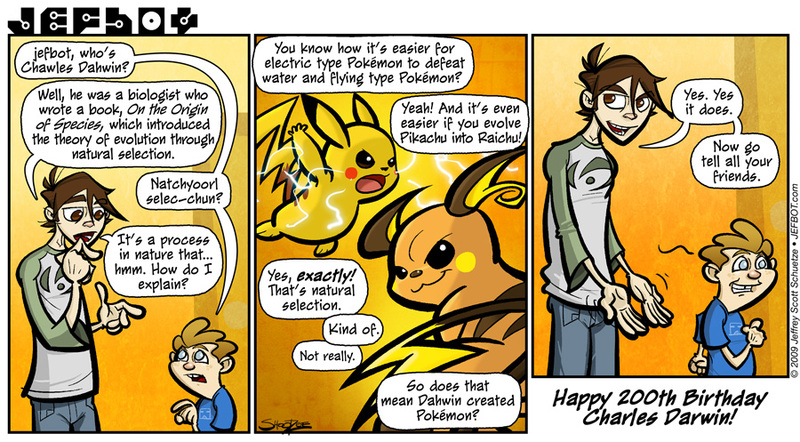 I also love how you used Pokemon to explain Darwinism. But more than anything, I LOVE how you are the only web artist on the entire internet who not only knows it’s Darwin’s 200th bday but did a kick-a$$ comic about it. Really great work, man. The little boy’s speech impediment is hysterical, too. Great work as usual. I LOVE lying to children about things like that. Good thing they don’t get exposed to me very often.